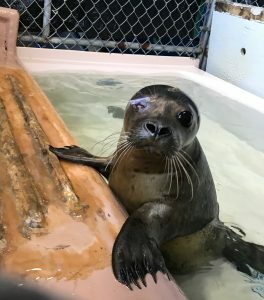 On Tuesday, September 26th, Sugar – one of our maternally dependent harbor seal pup patients – underwent a minor eye surgery. This was decided upon after multiple courses of treatments for ocular lesions in her right eye showed no signs of improvement. The primary lesion was likely caused by a viral infection, Phocine Herpes Virus (PHV-1), which created an ulcer in her eye followed by a secondary bacterial infection that got into the ulcer resulting in a clouded cornea and squinting. In extreme cases, this can lead to loss of the eye. NMLC Veterinarian Dr. “Sea” Rogers Williams started the procedure with a 15 minute sedation period followed by anesthesia. Due to Sugar’s anatomy as a diving animal, additional precautions were taken to minimize the risk of her going into what is called a dive reflex – the response to submersion as her body redirects oxygen and blood flow to vital organs like the heart and brain, slowing her heart rate to enable longer dive periods and causing her to hold her breath. Once Sugar was fully under, Dr. Williams began the procedure by inserting a tool into her eye to visualize the structure and evaluate the extent of the lesions. He then debrided (removed) the diseased tissue on the surface of her cornea. Next, small incisions were made in the inner lower eyelid and it was sutured to the upper eyelid with stitches, using the lower lid as its own version of an eyepatch. A small plastic tube was also sutured to her upper eyelid to provide extra support for the tissue and suture sites. In two weeks Sugar’s stitches will be removed and the ocular lesions will be reevaluated. It is our hope that by removing the diseased tissue this will promote healing and the creation of healthy tissue. Sugar is currently recovering well in Pod 2. Stay tuned for updates on her progress. Sydnie is a first-semester intern studying Environmental Science at Cape Cod Community College. We hope Sugar’s eye heals well and she recovers her full vision. Good luck little Sugar. We are sending good energy your way. Wow, this is fascinating. Wishing Sugar a speedy recovery, well done team!